Notes: Never thought it possible to give a zero star rating to noodles, but this one gets it for sure. Sometimes, the noodles I try are almost too hot to eat, but I eat them anyways. However, these noodles weren’t at all palatable; they were horrid. A bowl with a retort pouch and a sesame oil packet and base. Very nasty, due to the low quality retort pouch innards. I wouldn’t wish this stuff on my worst enemy. Perhaps tasting the food they make prior to allowing it to leave the factory might be a good tip. 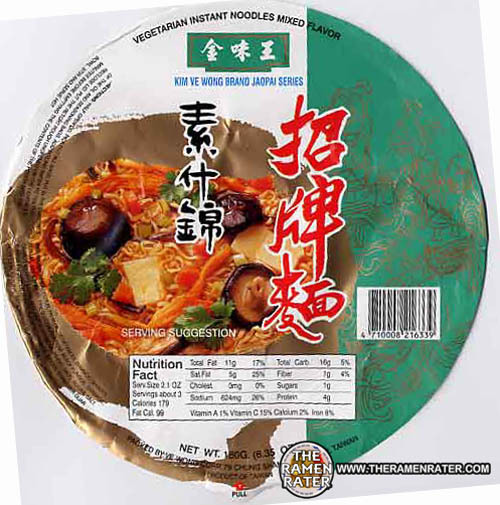 This entry was posted in * Stars 0 - 1.0, Taiwan, Ve Wong, Vegetable and tagged asian instant noodle soup, bowl noodle, buckwheat, chow mein, cooking, fried noodle, hans lienesch, instant noodles, instant ramen noodles, jaopai, kim, korean noodles, lienesch, mi goreng, noodle, Ramen, ramen blog, ramen blogger, ramen rater, ramen recipe, ramen review, ramen reviewer, ramen reviewers, ramen reviews, ramen video, ramenrater, ramenrater.com, ramyeon, ramyun, rater, rating, ratings, review, reviews, saifun, saimin, seattle, soba, spicy, taiwan, taiwanese, the ramen rater, the ramenrater, theramenrater, theramenrater.com, top ramen, udon, ve wong, vegetable, washington, wheat, wheat noodle, yakisoba on June 30, 2009 by Hans "The Ramen Rater" Lienesch.